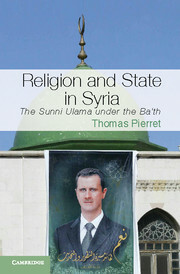 This February, Cambridge University Press will publish Religion and State in Syria: The Sunni Ulama Under the Ba’th by Thomas Pierret (University of Edinburgh). The publisher’s description follows. While Syria has been dominated since the 1960s by a determinedly secular regime, the 2011 uprising has raised many questions about the role of Islam in the country’s politics. This book demonstrates that with the eradication of the Muslim Brothers after the failed insurrection of 1982, Sunni men of religion became the only voice of the Islamic trend in the country. Through educational programs, charitable foundations and their deft handling of tribal and merchant networks, they took advantage of popular disaffection with secular ideologies to increase their influence over society. In recent years, with the Islamic resurgence, the Alawi-dominated Ba’thist regime was compelled to bring the clergy into the political fold. This relationship was exposed in 2011 by the division of the Sunni clergy between regime supporters, bystanders and opponents. This book affords a new perspective on Syrian society as it stands at the crossroads of political and social fragmentation.